As expected, CBS has pulled the plug on their long-running drama, Numb3rs. A mainstay of the Friday night schedule, brothers Charlie and Don Eppes won’t be back next fall with a seventh season. 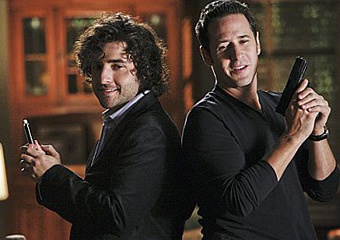 Numb3rs revolves around an FBI agent (Rob Morrow) and his genius brother (David Krumholtz) who helps solve cases with mathematics. The cast also features Judd Hirsch (as their father), Alimi Ballard, Dylan Bruno, Navi Rawat, Aya Sumika, and Peter MacNicol. The cancellation doesn’t come as much of a surprise, especially when you look at the figures. The ratings have dropped quite a bit in recent years. Last season fell to an average of a 2.2 rating in the all-important 18-49 demographic and 10.2 million total viewers. This season, the ratings dropped further still, to a 1.8 rating and 8.26 million viewers. CBS cut the show’s episode order from 22 to 16 installments last fall. While the official word was that CBS had an overflow of original programming, networks don’t usually cut the orders of successful shows. Should Numb3rs have been cancelled? The cast and crew filmed what could serve as a series finale and Morrow and Krumholtz signed on for new TV show pilots. While the actors would be contractually obligated to return to Numb3rs if CBS decided to renew it, ABC and FOX were confident that they wouldn’t. Last week, it was confirmed that the show’s sets were being dismantled, another sign that Numb3rs was finished. CBS has now made the cancellation official. On the positive side, Morrow will return next fall in a new series for ABC called The Whole Truth. He’ll play an attorney opposite Joely Richardson. Unfortunately, Krumholtz’s comedy pilot, Tax Man, was not picked up by FOX for the 2010-11 season. What do you think? Are you satisfied with the way that Numb3rs ended? What will you miss about the show? Will you give The Whole Truth a try? More about: Numb3rs, Numb3rs: canceled or renewed? I love watching numb3rs it is so exciting and very interesting and don’t why they cancelled such a great show, this series shows that we can use maths to do anything and we also get a better learning of mathematics an the important of what you can do with mathematics to solve problems.. i am looking out for season seven to be release or they continued from where they left off in season six, they really need to stop cancel the good series………. BRING BACK NUMB3RS!!!!!!! I just got to see numb3rs i thought it was a great show it actually helped my son want to do math because he loved the idea that it could help with solving stuff he knows its a tv show. i think they need to bring it back obviously keep the original actors cause it wouldnt be the same but have it where charlie and amita come back and that don and that lady are planning there wedding. I have been re-watching the series I love this show , I have too force myself too go too bed because I want too stay up and watch more and see what happens next. But now I’m close too the last show and it makes me mad that another GREAT series is gone too make room for stupid shows that I will never watch. Numb3rs was a well-written, well-acted show. I liked not only the premise, but the fact they depicted a real family, diverse and flawed. I liked the way they often presented two sides of a topic without taking sides (Season 6 – Henry Winkler as the Viet Nam Vet, and Judd Hirsch as the War protestor.) Of course it was cancelled. It was thoughtful, often insightful, an overall great program. The good die young! I am getting tired of good shows getting cancelled for stupid reality crap, I am not sure how you get your rating for viewers but you should look into the older and retired adults because I will guarantee you that not very many watch the reality stuff. OK, I spoke too soon. Lou Diamond Phillips was in the last episode. Mi malo…. I just finished watching (binge) every episode. I thought it was a great show and enjoyed the writing and the cast choices. They kept bringing back characters like Henry Winkler which I thought was a nice touch. The same with Lou Diamond Phillips who was missing in the last episode. I wish they kept the show. Looking back, I am sure they wish they did keep it. The success of NCIS and all of the spin offs would have made NUMB3RS a great addition to the CBS lineup. The show was very, very good, The writing for the family and how law enforcement was portrayed. Great character writing. How did I miss this show??? I just found it on HI and it’s great! It’s a really good show. Of course, they cancelled. A good show with good cast. Of course, they cancelled it. Will really miss it.